“Companies and consumers have to be willing to pay more for better produced chocolate,” says Debra Music of Theo Chocolate, a Fair Trade certified chocolate producer in Seattle. 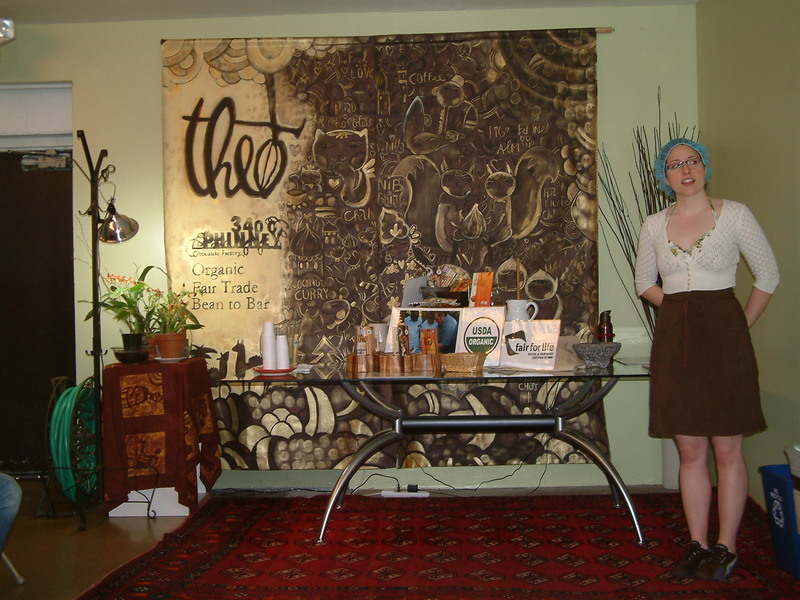 Theo says they are the only “fair trade chocolate company in the United States.” Taza also practices sustainable chocolate production through direct trade, which does not use a third party verifier. Theo partners with Jane Goodall. Theo emphasizes that cacao growers are hurt by the process with unsafe farming practices and low pay without knowing the end product (fact: most countries that grow cacao are too hot to mass produce chocolate). Note: Theo’s coconut curry chocolate rocks. There is an educational process that is required to make people care about Fair Trade. 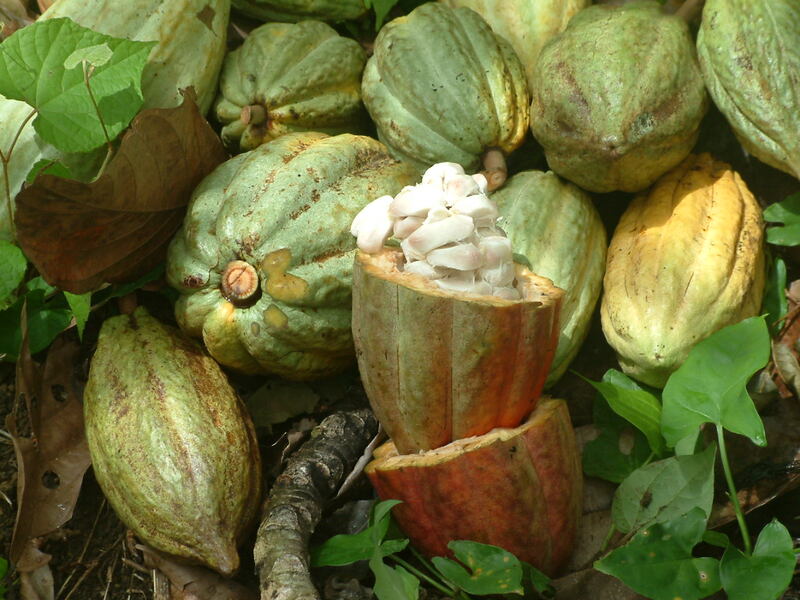 Companies and consumers have to be willing to pay more for better produced chocolate. Third party verifies confirm company’s relationship with the growers. Focused on the experience: “farm to you.” Interaction between the growers, the sellers, and the consumers. Bloggers are the vehicle. Finding innovative and new ways to get organic foods to consumers. People are seeking “the good food life.” Food is passion, and not just fuel. The “experience” is accentuated by giving consumers “the best” to enhance experiences surrounding food and sharing meals and stories = richer, stronger community ties. Important to know the real costs of good farming. Wal-Mart is the biggest supplier of organic farming. Aiming to reduce our dependence on foreign oil (har, har). FYI: Truffles are fungi that grow underground. No one knows how long they need to grow. They grow with trees, helping the trees absorb moisture faster and grow. Black truffles sell between $300-$380 per pound (gulp!). Not many people realize that truffles grow in the Pacific Northwest. Grow with Douglas fir. Female pigs (sows) have been historically used to hunt truffles, because the chemical of the truffle resembles that of the mouth of a boar. Trained dogs work better, because dogs aren’t hoping for a date. Truffles are spread by squirrels through poop. Careful raking is required when harvesting, in order not to break the root system. The sixth sense when it comes to truffles: the burp. Truffle taste is greatly tied to its gases, there are 30-40 present in the black truffle. Truffle oil takes 15-20 days to produce. This post was blogged live from the International Food Blogger Conference in Seattle. Thank You! Did you get information on an eco-tour to hunt truffles with pigs? Do I have to start one? I know they are hunted in Oregon, but where to find them in Washington. Now I’m curious! (Was thinking pigs but dogs are okay too). Thanks for posting so much!